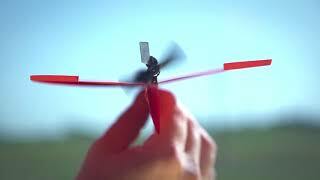 POWERUP 3.0 Smart module transforms an ordinary paper plane into a motorized, app-controlled flying machine. This multiple award-winning conversion kit features a crash-resistant design that can give your paper plane a 180-foot flying range. Flying with POWERUP is easy. Just tilt your smartphone left or right to steer, and use the throttle level in the app to ascend or descend. Shai Goitein came up the idea for a remote controlled paper airplane while teaching immigrant kids the principles of aerodynamics. POWERUP 3.0 combines technology and art by allowing pilots to be involved in the creation process. Need a hand with take-off? An in-app flight academy provides step-by-step instructions for folding and flying.